SIDNEY, British Columbia, Canada, February 8, 2011 (ENS) – The first link between salmon farms on the British Columbia coast and elevated levels of sea lice on juvenile Fraser River sockeye salmon has been demonstrated by new research published today. While there has been speculation that lice from captive salmon has been transferred to wild salmon, the new study is the first to show a potential role of salmon farms in sea lice transmission to juvenile sockeye salmon during their critical early migration to the sea. The rapid growth of marine salmon farms over the past two decades has increased host abundance for pathogenic sea lice in coastal waters, and wild juvenile salmon swimming past farms are frequently infected with lice, the authors say. “Given the high intensities of lice observed on some juveniles in this study – up to 28 lice on a single fish – there’s an urgent need to understand the extent of threat posed by sea lice to juvenile Fraser River sockeye,” said co-author Dr. Craig Orr of the Watershed Watch Salmon Society. The scientists examined sea lice on migrating sockeye in an area of Canada’s west coast between Vancouver Island and the mainland known as the Discovery Islands, taking samples in 2007. This region hosts the northeast Pacific’s largest salmon farm industry, 18 active salmon farms, and also hosts one of the largest migrations of salmon in the world, primarily to and from the Fraser River. The scientists genetically identified 30 distinct stocks of infected Fraser sockeye that pass by open net-pen salmon farms in the Strait of Georgia, including the endangered Cultus Lake stock. These same species of lice were found in substantial numbers on the salmon farms. Not only did juvenile Fraser sockeye host higher lice levels in the Georgia Strait after they passed salmon farms, the researchers found that these fish hosted “an order of magnitude more sea lice” than Skeena and Nass River sockeye that migrated along the north coast where there are no farms. Sea lice can compromise regulation of fluid within the bodies of the host fish, induce behavioral changes that increase predation risk, reduce growth rates and, in sufficient numbers, result in host death. Sea lice also have been shown to serve as vectors for the spread of fish diseases. “The implications of these infections are not fully clear, but in addition to any direct physical and behavioural impacts on juvenile sockeye, sea lice may also serve as vectors of disease or indicators of other farm-origin pathogens,” said lead author Raincoast Conservation Foundation biologist Michael Price. The study also recorded high lice levels on juvenile sockeye near a farmed salmon processing plant in the Georgia Strait, heightening concern for the full potential impact of the salmon farm industry on wild salmon in this region. The British Columbia Salmon Farmers Association says that sea lice on farmed salmon are monitored and managed to minimize possible transfer to wild populations. This work is audited by provincial authorities and is a condition of farm license. Every salmon farm is monitored monthly and, during the spring months when juvenile salmon may be traveling past the farms, fish are inspected at least once every two weeks. If the average number of motile sea lice reaches three per fish, veterinarians prescribe the medication emamectin benzoate, called SLICE, to remove the lice from all salmon on the farm, the association says. The chemical is delivered to salmon through fish feed. Fisheries and Oceans Canada says there is no risk to human health from eating salmon infected with sea lice. “Sea lice live on the outside of the fish and feed on the slippery mucus on the skin of the fish. They would not affect human health if eaten, and usually the lice fall off or are cleaned off during harvesting or processing activities before the fish even reaches the consumer,” the agency says. 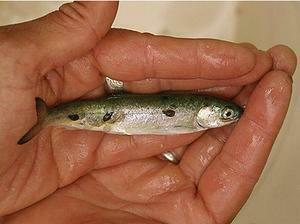 Sea lice from salmon farms are one more stressor for sockeye already subjected to multiple human impacts. Yet lice are not the worst of the stressors the young salmon face. The authors say that risks to juvenile sockeye from open net-pen salmon farms can be much more easily mitigated than changes to ocean conditions from climate change and ocean acidification. Recommendations include removal of farm salmon from the migration routes of juvenile sockeye, and transition of salmon farms to closed-containment facilities. Cycles of abundance vary greatly for Fraser River sockeye returning from the sea to spawn in the river where they themselves were spawned. The returning population of Fraser River sockeye in 2009 was a very low 1.37 million, just 13 percent of the pre-season forecast. 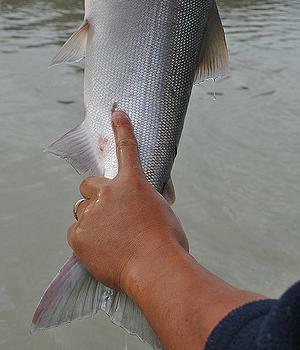 But the number of sockeye returning in 2010 was around 30 million, the largest sockeye run in 97 years.